The single man will receive the maximum total benefit if he signs up for Social Security at age 69. He would receive $38,679 more income – total benefits over his entire retirement period – than he would by claiming at 62. The single woman, who tends to live longer, can maximize her benefit by waiting until age 70; she will receive $58,668 more during retirement. 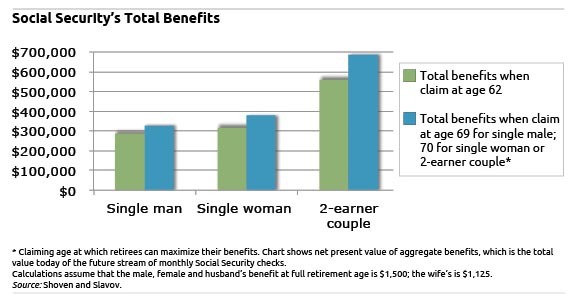 The two-earner couple gains the most if the husband starts his benefits at age 70 and the wife claims a spousal benefit – based on her husband’s earnings – at age 66 and then, at age 70, claims the benefit from her own employment. Doing so would generate $124,342 more income than if both spouses had claimed Social Security at age 62. Research shows that many people don’t put a lot of thought into when they’ll retire. But this decision is a critical one for middle-class and poor Americans. It’s also not easy for most people to figure out how much more they can get. The explanation for why it pays to delay has to do with the value of a dollar today, compared with its value next year. When interest rates are high, most people would prefer to receive one dollar today on the assumption that it is worth more than a single dollar received next year. The dollar in hand could be invested, earning money and increasing in value during that time. But with inflation-adjusted rates currently running at 0 percent – as Shoven and Slavov assumed in their estimates – the dollar next year is worth roughly what it is today. In short, it pays to delay and collect the larger check later, because every dollar in that check has held its value. To read a related paper by Slavov and Shoven, click here. It’s important to consider the qualitative aspects of taking the benefit early, meaning anytime before age 70. Current market conditions may make it worthwhile to begin the benefit early (or delay). While you’ll have more “money” later in life, you may enjoy it more now. What’s the price of delay in qualitative terms? Only the client can help determine this. It is a personal choice. Perhaps if you believe the premise that there is no inflation, then this article makes sense. However, it is obvious to most everyone that groceries and the cost of gas has and is going through the roof. With the money printing presses working overtime, inflation is sure to continue. I’ll take my money now before it is worth a fraction of what it is worth in the near future. I agree with the smart comment by Eric McClain about qualitative considerations of when to take the benefit. Although I thought the argument presented here for taking benefits later was interesting, I thought that in real life, and in practical terms, this is a weak argument. It may be somewhat material for someone who simply doesn’t need their benefit at all. But that is remote for the vast majority of Social Security recipients, who will definitely NOT be “holding and investing” their early payments. I agree that many more people should delay, but the more important and practical reason is that it is a form of longevity insurance. As long as someone can do without the money earlier, it’s good to minimize the risk of being broke in late life, especially with (deplorable) efforts to lower the Social Security inflation adjustment even more below the actual cost-of-living rises for things elderly people buy. The report says nothing about the state of health of Social Security. We all know it’s in trouble; it’s a ticking time bomb. Social Security’s own website admits that by 2033, it will only be able to fund 75 cents on the dollar. That is about the time I will start collecting. I plan on taking it as early as I can, before the till runs dry. So if you die anytime before you collect the difference you lose! Take the money at 62 its a no brainer! They are just trying to manipulate the system by making you think its best to wait. ITS NOT! You are gambling with thousands and thousands of your retirement money…BAD IDEA! If you lose then the Government and perhaps the author who wrote this wins! Troy McClure and Dave are both very short-sighted. I recommend Mr. McClure read Duncan Black’s sensible column from yesterday at http://www.usatoday.com/news/opinion/forum/story/2012-09-17/social-security-cuts-broke/57801378/1 . Dave, so you’re betting you will die early? If you do die early and you can manage without the money, you haven’t lost much. If you die late and you have a much lower monthly amount in your 90s, you are likely to be VERY VERY sorry. Now, if you have a terminal diagnosis or reason to reasonably believe your lifespan is especially short, I would agree that you should go ahead and collect. Otherwise, you’re being foolish to reason in this way. And you may be doing your later-life self a great disservice. This statement quoted from the article is a LIE…because inflation really IS rampant in areas the CPI doesn’t measure BY DESIGN. And additionally, Social Security is NOT a defined insurance plan. It is a tax-based system, with no guarantee of eventual payment to THOSE WHO PAID THE TAX, and the system could be changed, for the worse, at any time. This is an obfuscative article engineered to deceive. Social Security benefits are adjusted for inflation. So in reality, if you believed there was inflation, you would prefer to delay benefits. Delaying to 70 can also protect against longevity risk for married couples because the higher benefit will continue. So by delaying you are also increasing the benefit that would continue until the last spouse dies. The government wants everyone to wait until just before death to sign up for Social Security benefits so they won’t have to pay many benefits back. Collect at 62 if you’re financially able to do so. I didn’t see taxes addressed by the study. For those with additional income you need to consider your tax situation. For example, those with traditional IRAs and 401(k)s have mandatory minimum withdrawals starting at age 70.5. Taking a higher Social Security payment later at age 70, may push you into a higher tax bracket when combined with the traditional IRA/401(k) income. Your higher (age 70) Social Security payments may take a tax hit. Also, will taxes (federal and state) rise between age 62 to age 70? Interest rates, inflation, and taxes all come into play. If Social Security is your only income, then taxes are not an issue. Waiting may be beneficial for some but not for others. It would help to see the “what-if” results – assume inflation is not zero, which is probably realistic given our debt situation. Paul raises the issue of taxes. If one believes that taxes will be going up – as I do – then does it not make sense to draw down a 401(k)/IRA now and leave the Social Security to increase. At the most, only 85% of Social Security will be taxable where as 100% of the 401(k)/IRA will be taxed! This is a good article. I am sorry that so many people miss the main point. There are a lot of unknowns, but the net present value is the best way to look at it. My wife and I are going to take our Social Security benefits at age 70. She is drawing on my Social Security now, so I am doing what the article recommends. This is the first time I have written a reply, but I had to do it after seeing all the negative comments. Please explain the suggestion that only 85% of Social Security benefits would be taxed (whereas all of one’s TSP/401K benefits will be–I get the latter point). I was granted Social Security disability benefits at age 48 due to an aggravation of a pre-existing, service-connected condition. I was also granted Office of Personnel Management retirement disability, as well as Federal Workers Comp, to that same period. I am now 58-years-old and my Social Security disability is near $1,500.00 per month, and I am so glad that I don’t have to be concerned with those idiots in Congress reducing my benefits to pay for their outrageous behaviors and performances. I will never take a ticket back to work so they can steal my earned benefits. What are the thoughts on this: My husband died at age 50. If I wait until 62-65 to file, am I eligible for HIS benefits, or mine? As a housewife that worked only part-time, he paid much more into it than I did. I am 57 now. Thanks. If your husband earned more than you, you are probably eligible as early as age 60 to receive a higher benefit based on his earnings – that is, if you were married more than one year. [If you are disabled, you can draw his benefit as early as age 50]. But I caution you that the devil is in the details, and there are numerous filing strategies, depending on your situation. You’re strongly encouraged to discuss this in detail with a Social Security Administration representative at 800-772-1213. As a single person, I am struck by how much the Social Security system favors couples. The couples will get more than twice what the singles will get, even though two together can live more cheaply than two apart. And people in a couple can benefit from the Social Security of a dead spouse. If I die, no one in my family gets anything from Social Security though I have paid in my whole working life. Even the $225 death benefit is available only to a spouse. Guess singles don’t need burial!